How was your week last week? Did your menu plan go as planned? Mine kind of was all over the place but by the end of the week it all worked itself out. That’s the beauty of menu planning. Regardless of which night you have something scheduled for, if you wake up that morning and just don’t feel like it or if you forget to thaw your needed meat or forget to toss your dish into the slow cooker, well you can just do the recipe shuffle as I like to call it. Move Tuesdays meal to Thursday, etc. This is why I really only menu plan 5 of the 7 days of the week. It gives me some leeway in case something goes awry and let’s face it something almost always does. Life happens but I don’t have to panic about it because I have 5 recipes planned out with all the groceries bought so it’s easy to move days around. It’s all good. There is so much freedom in menu planning!!! If you missed Crystal’s easy recipe guest post this weekend, be sure to check out her recipe for Crockpot Orange Chicken Stirfry. 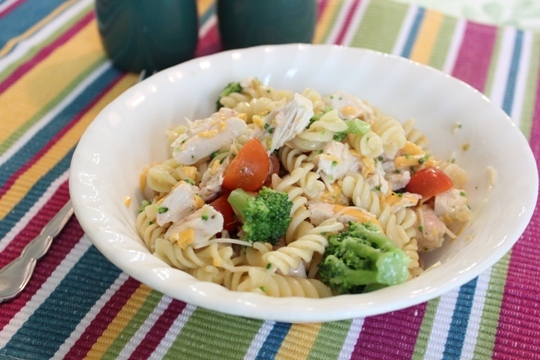 My recipe highlight from last week’s menu plan goes to the Chicken Bow-Tie Pasta Salad. Easy and delicious…my favorite combination! 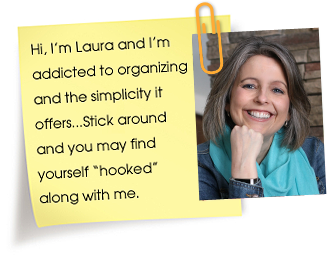 I totally agree with you, Laura. As long as I have bought all the ingredients for the meals I planned, it really doesn’t matter what order they go in. Some days I don’t want to stand at the stove or I missed the window to get something in the crockpot. Either way, I try to stay flexible. It’s still better than having NO plan! 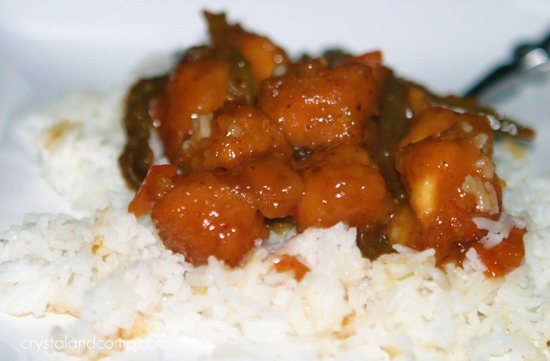 Queen of the House- the Crockpot Orange Chicken is super easy. Perfect for busy moms for sure. I hope you and your family enjoy it as much as my family does! Thanks for your sweet words, Sinea! I am a live in care giver for a family, housekeeper, animal tamer, cook, bottlewasher, and all around whatever, lol. And to top it all off, all three are extremely picky eaters! the wifes brother wont touch barely any meat, and will only eat certain veggies. He is actually easy, just the same thing every day! I am always on the hunt for something a bit different, because the same’ ol same’ ol gets tiring after awhile, but with them being so picky, gads! So I make up a guide menu, that about 85% I go by for the week, Saturday evening is my *day off*, so all I have to get on Saturday evenings, is something for the brother to eat, and usually I call out for pizza or some other delivery. Sunday evenings I try to do a nice *family dinner*. Pot Roast, Pork Tenderloin, New England Broil, something of that effect, while the rest of the week……whatever I can get them to eat, lol. If you see in my blog that I exploded, I did! hehe. I will say one thing, you give me an idea of at least one meal a week, and that just helps so much! Orange chicken str-fry sounds delicious! I’ve been slowly learning how to make Chinese-esque food at home . Definitely cheaper, and I figure it’s gotta be healthier too :-). I’m # 97. My husband and I started a super intense workout program, so I’ve been making lots of simple, frugal, but power-packed meals to help keep up our calorie count. Steph- isn’t it awesome to have a simple and affordable way to make Chinese take out at home? Let me know if you give this recipe a try. It is yummy for sure! I’m always shuffling my menu plan around. I love that it gives you that freedom. You have the food on hand but don’t have to eat it a specific night so you can eat what you really want each night. Have a great week and thanks for hosting! Hmm. I posted a comment this morning but I don’t see it here.. Sorry if there is a duplication later! I’m rejoining MPM (and blogging) after a hiatus to have our first child. We are actually expecting number two now lol! The orange crockpot chicken looks awesome and I’m so excited to try that! Angela- thanks for your kind words about the Crockpot Orange Chicken. I hope it is a recipe that makes it on your meal plan soon. Thanks for hosting this, you rock. It feels good to get this planned out at the beginning at the week. I have got to try that Chicken Bow Tie Pasta Salad, it sounds right up my alley. I agree the menu plan shuffle generally happens during the week. Life happens, you run late. But you have a plan that will work and the food to make that quicker meal you planned on Thursday. It’s great and we can definitely tell a difference when we don’t a have a plan. It’s also nice for the both of us to sit down Sunday morning (our only day we get to eat breakfast together) and plan the menu together. That way we both get what we want.